The euro continued its decrease against the dollar. The Eurozone good economic data could not support the currency. According to the Gfk, the Germany consumer confidence rose to 9 with 8.7 in January and earlier we expected to see 8.8, still the Germany producer price index (PPI) is fixed with growth for the year -0.9% y/y after -1.1% y/y in November. The business confidence stopped at the mark of 99 points in December. Such indicator justified economists’ expectations. 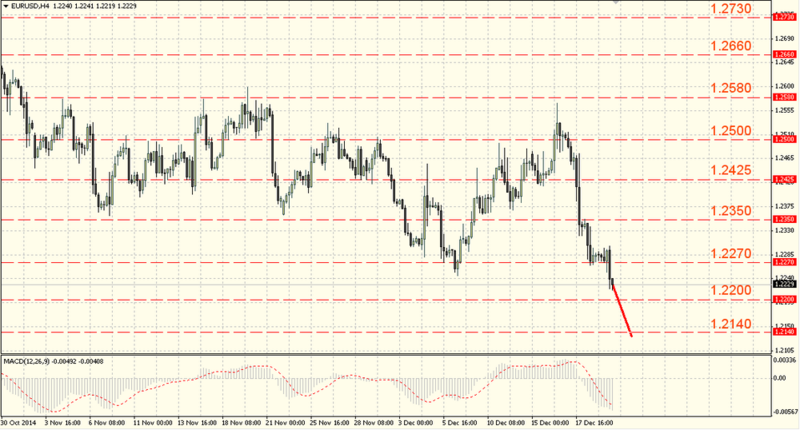 The pair euro/dollar continued its decline and tested the support near 1.2250-1.2270. The bears’ enthusiasm was over here and the pair entered the consolidation phase. Then the pair broke the level of 1.2250-1.2270 downwards. It is possible that the ongoing support will be temporary and the bulls will try to develop an upward correction, the nearest target is the resistance near 1.2350-1.2370. The support breakthrough will lead to the level of 1.2100 testing. The sterling slightly fell against the USD. Earlier the pound strengthened against the dollar and against other competitors as it was supported by the UK economic data that showed the very good results. In November retail sales including the UK fuel price increased by year on year 6.4%, compared with the expected 4.4%. The consumer confidence indicator by the GfK showed a decline to 4 against 2 in December when we expected improvements to -1. After another unsuccessful support testing around 1.5530-1.5550, the GBP/USD was able to rebound from it and to break through the resistance at the mark of 1.5600-1.5620 and rise to the level of 1.5650-1.5670. The pair failed to fixate above this level and decreased below it. The pair decrease is limited by the local support around 1.5580-1.5600 that allows us to consider resistance testing at the mark of 1.5730-1.5750 in a short term. 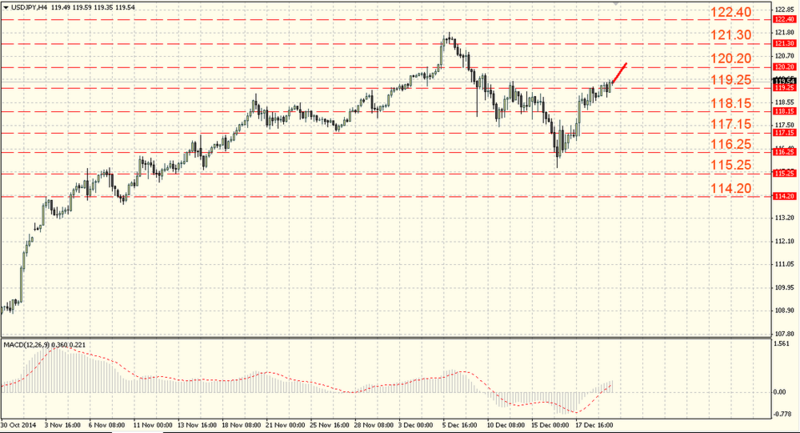 The loss of 1.5580-1.5600 will lead to the level of 1.5510-1.5530 testing with a high probability of its breakthrough. The pair dollar/yen was traded in the narrow side corridor and closed the trades at the opening price. The Bank of Japan is more optimistic about the economy state as a whole and increased its export, industrial production and the housing market investments assessment. The Japan stock market is also optimistic after the Nikkei rose by 2.39%. The bears tried to take over the initiative, but their attempts were unsuccessful when the support near 117.95-118.15 was able to keep their attack. 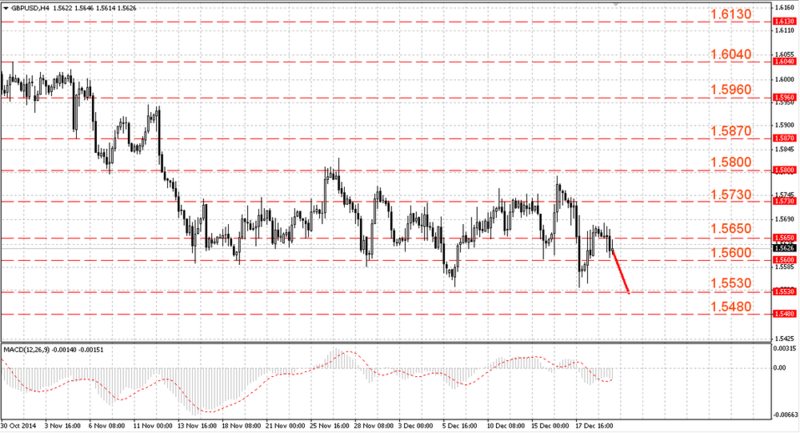 The pair increased above the resistance level of 119.05-119.25. We should not exclude the level of 120.20-120.40 testing. Its breakthrough will lead to a growth to 121.30-121.50 and the loss of the support near the 119th figure will allow bears to test the level of 117.95-118.15.